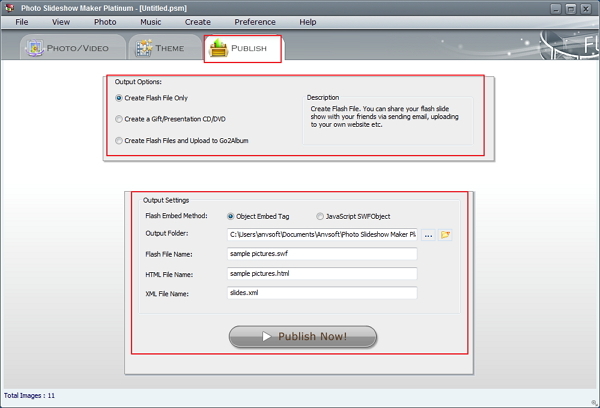 Photo Slideshow Maker Platinum provides users with hundreds of well-designed flash templates. You can choose whatever you like to apply to your photos. 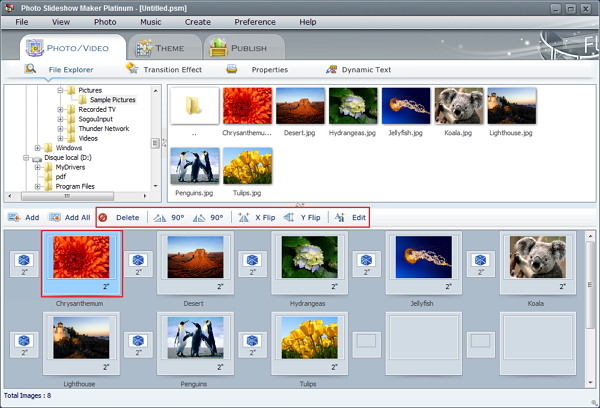 Moreover, Photo Slideshow Maker Platinum allows you to customize templates on your own. Download Photo Slideshow Maker Platinum and create your own flash templates now! Start the Photo Slideshow Maker Platinum, open the window PHOTO/VIDEO. Under File Explorer, you can search the photos folder or video folder, and the photos and video will be shown on the right window. 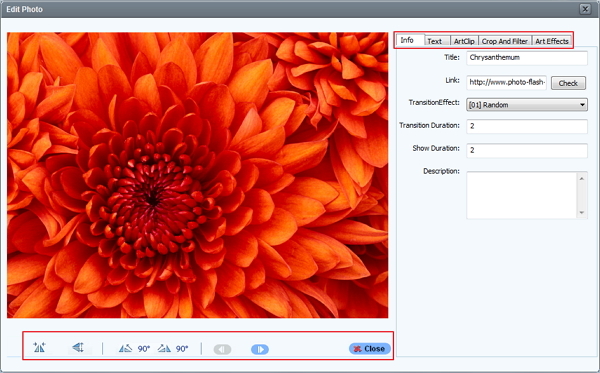 Double-click on a photo or video to add or direct drag & drop FLV videos or photos to the video/photo area. 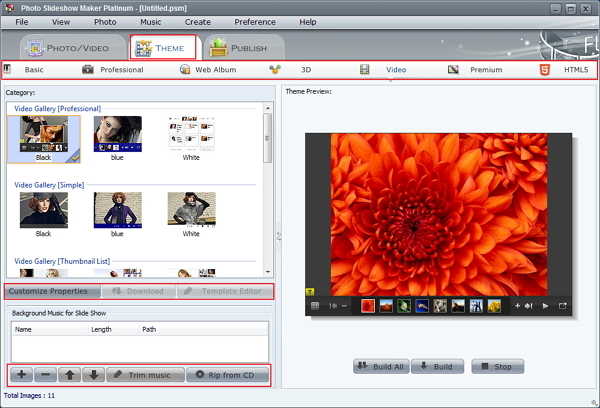 You can also just click Add/Add all button to add one or batch videos to Photo Slideshow Maker Platinum. To edit the FLV video or photos you can click Edit button or double click on the subject, the Edit Photos window will pop up. Here you can add URL, title, description, text and art clips to the photo/video, rotate 90 degree of the picture/video, set the transition effect and duration for the video slideshow. 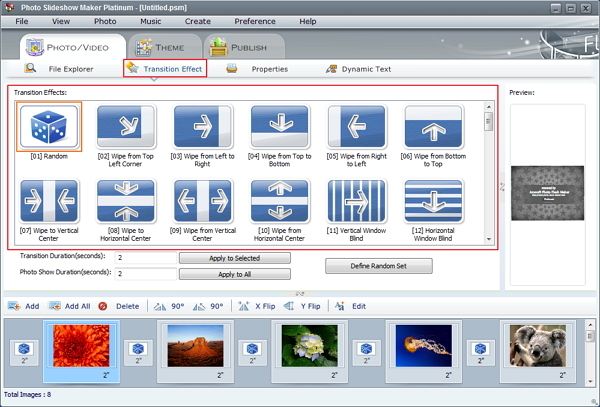 Click Transition Effect button, choose some transition effects for your video slideshow. Go through the Theme tab, hit the plus button to add music files from your computer. You can also get music from CD by hitting the relative button. Photo Slideshow Maker Platinum offers 7 different categories of templates. They are Basic, Professional, Web Album, 3D gallery, Video, Premium, and HTML5 templates. To create video slideshow, click Video, select a video template and click Build All. In the preview windows you can see the effects. Click Customize properties button, you will find lots of properties of the video slideshow to be customized to achieve your expect. Go to Publish panel and click Publish Now! button to create the video slideshow. 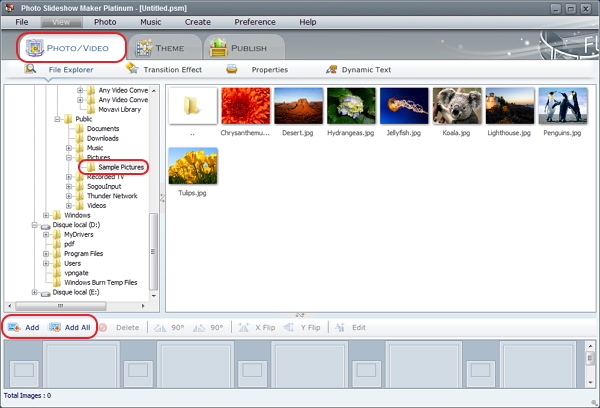 After it has been published, hit the button "Open Output Folder" to get all produced file and watch your video slideshow. I have Photo Slideshow Maker Platinum loaded (and licensed) on my computer, the platinum version is up and working well, most impressed by the 3D and new options available. Burn photo slideshow DVD for watching on TV and create slideshow video for media players such as iPod, iPhone, iPad, Android devices. An all-in-one DVD & video recorder, video converter, protection removal, YouTube downloader, video editor and DVD burner. Free iPhone, iPad, iPod Transfer & Manager Tool for Windows; Audio &amp; Video Converter &amp; Ringtone Maker.